In this paper, we present a model for evaluating bandwidth sharing policies, that can be applied to networks that handle both video streaming traffic, as well as other traffic. Video streaming is a demanding network application. In crowded networks, resources need to be properly divided in order not to diminish the streaming experience. However, in network deployments with a large number of users, the streaming performance cannot be obtained straightforwardly from a sharing policy. Therefore, we propose a Markov model that is compatible with Dynamic Adaptive Streaming over HTTP (DASH), the major technology for video streaming over the Internet. If DASH is combined with in-network resource management, its performance can be significantly improved. Nevertheless, resource sharing policies need to be configured. This requires evaluation of many different configurations. Real deployments or network simulations demand many system resources and time. In contrast, our model can quickly evaluate many configurations, and for each configuration output the expected video bitrate and number of changes in video bitrate. These two parameters play an important role in the Quality of Experience of the viewer. In this paper, we demonstrate how our model can be used to analyze and optimize resource sharing policies. As such, our model is a useful tool for network administrators and allows them to better provision and configure their networks. Kleinrouweler, J.W.M, Cabrero Barros, S, van der Mei, R.D, & Cesar Garcia, P.S. (2016). 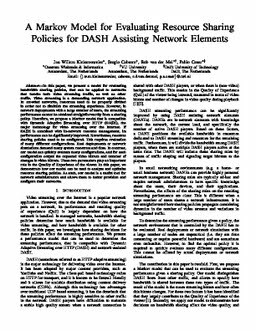 A Markov model for evaluating resource sharing policies for DASH assisting network elements. In Proceedings of International Teletraffic Congress 2016 (ITC 28) (pp. 112–120). ITC.